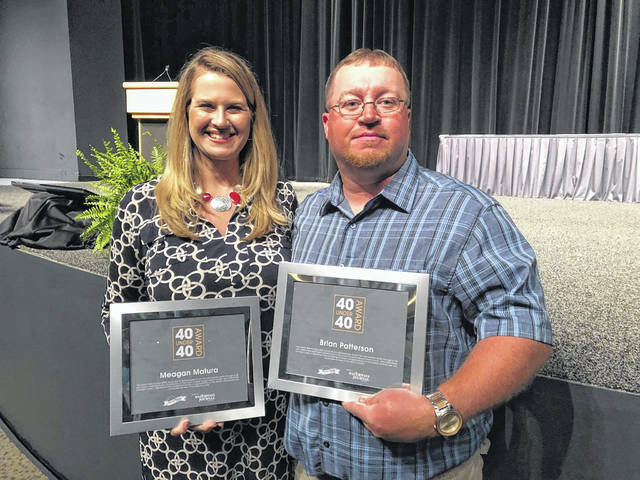 Two locals, Meagan Matura and Brian Patterson, received a national award for the inland marine industry. The 40 Under 40 award was conceived for the 5th annual Inland Marine Expo (IMX) to highlight some of the inland marine industry’s future leaders. All 40-award winners were nominated by various industry executives and peers for their outstanding contributions to the inland marine industry. The 40 Under 40 awards were presented at IMX in Saint Louis, MO on May 22. Matura joined the inland waterway industry in 2014 with a background in economic development. She became the Chief Administrative Officer for Superior Marine Ways, Inc. and its subsidiaries in January of 2017. She is one of the youngest executive officers in the industry and one of the few female executives in the Ohio River Basin. She provides leadership to the finance, human resources, marketing, business development, safety and environmental departments of the company. In addition, she serves as the Port of South Point Director through our partnership with Lawrence County Port Authority. After entering the industry, she became actively involved with Inland Rivers Ports and Terminals national association and was voted on as a board of director in 2016 representing the Ohio River Basin. She has been involved in the M-70 Container on Barge project through IRPT. Meagan has presented at the Ohio Freight Conference, Ohio River Basin Alliance Annual Summit, and a MARAD regional meeting on the concept of a container on barge cooperative. In 2016, IRPT and the Panama Canal Commission signed a memorandum of understanding for reciprocating marketing efforts, Meagan traveled to Panama to represent the Ohio River Basin at this historic signing and spoke on behalf of the basin. Michael Manns, Superior CEO said “She is a champion of the river industry, promoting it wherever she goes and supports multiple organizations. She works tirelessly with the private sector on transitioning to the river for their transportation supply chains trying to increase inland waterway users for us all. She is truly one of our industry’s top 40 under 40 and we are thankful she is on our Superior team.” Matura also currently serves as the Gallia County Chamber of Commerce Board President and Chair of the University of Rio Grande Alumni Council. She holds a bachelors degree in Communications from the University of Rio Grande and a Master of Business Administration from Ohio University. She and her fiancé, Joel Wood, share three children: Nick Barnes, Abby and Jake Wood. Patterson works for AmherstMadison, Inc of Charleston, W.Va. and they also have a shipyard facility in Gallipolis, Ohio. He became an associate of AmherstMadison in June of 1999 right out of high school. He hired in as a machinist at the shipyard in Henderson, W.Va., where his duties included burning, fitting, and welding. He also became a crane operator and a boat pilot all before the age of 30. Amherst has several sternwheeler boats that he also became proficient in operating. It was decided several years ago to bring him shore side to be a part of our management team as a Construction Division Manager. Brian is a true riverman and has done so much so quickly in his career. Charlie Jones, CEO said “His dedication and passion makes us proud to have him not only represent AmherstMadison, but to be nominated as an industry person who has done so much with so much energy.” Brian devotes a substantial amount of time of outside of AmherstMadison to the river industry. He always attends and is an integral part of many of the summer and fall Sternwheeler festivals, taking his family along on Amherst Madison’s historic sternwheeler to these events demonstrating the roots of the river industry and how the river was the foundation of our country’s industrialization. Brian and his wife Shelia have one daughter, Rebecca. Patterson is active with RiverWorks Discovery’s programs to educate high school students about careers in the river industry. These programs include a mini-deckhand training, line-throwing contests and also presentations about possible careers to hundreds of students in attendance. Matura and Patterson both serve on the Point Pleasant River Museum and Learning Center executive board. The purpose of this organization is to preserve the history of industry on the Ohio River. In addition, the Learning Center component is working with the US Coast Guard to develop training materials for SubChapter M compliance and also offering continuing education for industry professionals like Radar training and Advanced Pilothouse Management. The center has two pilothouse simulators that are used in training and also educate the public about the industry. In 2017, Patterson received an award from the Point Pleasant River Museum for his significant contribution to the river industry. This is a prestigious recognition reserved for most people after retirement, but the selection committee felt his contributions to the industry were deserving of this award well before his career ends. Patterson chairs the annual Tribute to the River held on Labor Day weekend through the museum. The festival includes a ceremony to honor deceased rivermen, honors our heritage through sternwheelers on display, demonstrates our current tow vessels and concludes with live music and a fireworks display. Brian dedicates many hours to this event every year; it pulls many into our region and provides great entertainment for families. The inland waterways system includes 12,000 miles of commercially navigable channels and 240 lock sites. These “inland highways” move commerce to and from 38 states, serve industrial and agricultural centers and facilitate imports and exports at gateway ports. By safely and cost-effectively moving America’s cargo, barge transportation makes a vital contribution to our nation’s economy, environment and quality of life. In 2016, 604 million tons of waterborne cargo transited the inland waterways, a volume equal to roughly 14% of all intercity freight and valued at nearly $232 billion.